Best inner tube. I use it for both Schwalbe and Maxxis tyres. These have worked great so far. I did a 750+ km bike tour in Canada with these and Schwalbe Almotion tyres and had no flats at all. I really like how the same tube can work interchangeably with 650b and 700c Schwalbe Almotion tyres. Very well designed and made. As always great service from Merlin. Tubes are good no problems after 800 miles. One of the toughest innertubes on the market. 147% the thickness (and weight) of standard innertubes. This, combined with the great build quality and being checked twice in-factory... makes them extremely resilient and leak-proof. I'd say these are best as a general-use tyre and not for racing folk who want lightweights. Can be used with the following size tyres: (50 to 60)-584, (40 to 62)-622 and 40-635. Decent tube for the money - not quite as light as the Schwalbe x-light, but about 205g for the 27.5"
Came as part of a bundle with 2 new tyres but have to say these are quality tubes as you would expect from Schwalbe. 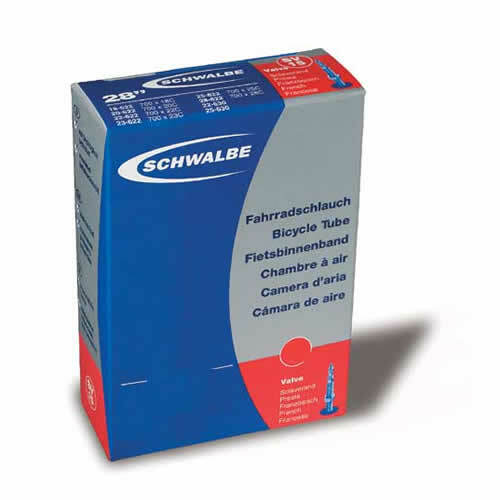 Schwalbe are my go to tubes, regardless of of what size I am after. Decent weight, and don't seem too prone to punctures. Merlin, as usual, do them for the best price, and delivery was stupidly fast. Great quality tube and a good weight. It's an inner tube.... Smells rubbery and is black. Good product and great price. I changed the tube 2 rides ago and no problems. Hard wearing and good quality. Lite weight good utilitarian tube. Great when you need them! Great value good quality inner tube. Quality rubber with removable valve core. Ideal as a spare if run tubeless. It's an innertube...not much more to say.